Limited edition digipak incl. the bonus cover track of NINE INCH NAILS’ classic “Wish”. “Red White and Blood” is the Thrash album that every Metal aficionado has been wishing to hear for the last decade: crunchy riffing, capturing melodies, killer solos and exactly the right dose of unashamed aggression. 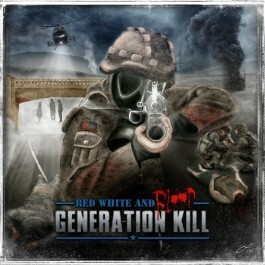 This should come as no surprise as GENERATION KILL was formed by current EXODUS frontman Rob Dukes and bassist Rob Moschetti (ex-PRO-PAIN, M.O.D.). Although their roots clearly show through and METALLICA, SLAYER, ANTHRAX, MEGADETH and TESTAMENT come to mind, new dimensions are introduced by Jason Trenczer, master of technical guitar work, and Lou Lehman, contributing catchy riffs and solos. Veteran drummer Sam Inzerra (MORTICIAN) adds an extra dose of speed and power to this killer album that knows no fillers. Get the thrashing of your life!